'Abdu'l-Bahá's Journey in the West . . .: Our film is being replicated! 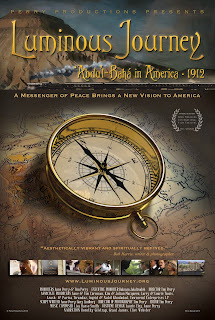 Since it RELATES to the subject of this blog, I can happily announce that our long-in-the-works documentary film, Luminous Journey: 'Abdu'l-Bahá in America, 1912, is now being replicated! And we have a few screenings set up--see below--and one in Eliot, ME on Mon. Aug. 12. This project has been interwoven with the research and blogging I've been doing since April 2011 and planning since 2009 and evolving toward since 1971, when I first heard of 'Abdu'l-Bahá. The Journey is larger than any of us can grasp or understand--and it has been such a distinct privilege to be on it--and to be sharing parts of it with you. Meanwhile, 'Abdu'l-Bahá is still in Egypt (in 1913), recounting His adventures and resting before returning to Haifa. Yet, He says, "I am always a traveler to America." Thus, the Journey never grows old. . . .